For most people, the thought of hiking through cold, boggy tracks to sleep in a small tent on a steep hillside, and then to be woken four to fives times a night, doesn't sound like a holiday. But that's how volunteers looking after the nests of New Zealand's kakapo have spent two weeks of their summer holidays this year. 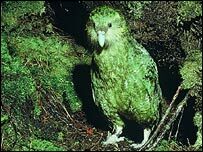 The critically endangered kakapo - fat, green, musty-smelling nocturnal parrots, which cannot fly but can climb tall trees - are confined to New Zealand's offshore islands. Kakapo (Strigops habroptilus) numbers dwindled to just 51 in the mid-1990s, but an intensive conservation effort has boosted their numbers. This year, on the predator-free Codfish Island/Whenua Hou, off the bottom tip of New Zealand, a team of volunteers and Department of Conservation (DOC) staff have watched over five new chicks. "The people that we want, who are interested in conservation, they usually seek us out," Vivienne Parker, who organises the volunteers for DOC's kakapo team, told the BBC News website. "All the volunteers we've had have been absolutely amazing. Just incredible." Each night, nest-minders camp in a tent near a nest. 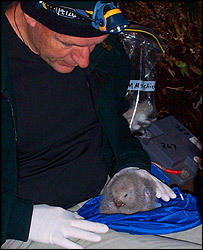 Their job is to monitor the egg or chick whenever the mother leaves the nest, moving in with special heat pads to help the egg or chick stay warm. "Nest-minders get woken up at all hours... from seven o'clock in the evening, right through to four o'clock, six o'clock in the morning," explains Tony Preston, a member of DOC's kakapo team. DOC also uses volunteers to trek around the island to provide the nesting birds with supplementary food. Another volunteer cooks the meals for the 15 or so people on the island during a breeding season. Ben Machin, an automotive engineer from Dorset in England, has found it wasn't so much waking up that was the problem during his nest-minding stint. "It's more your nerves that you have to get over," he says. "You go up there a couple of nights with somebody who is a veteran and they make sure everything is good, which gets you over your first time. It becomes second nature really after that." Taking the food to the birds' feeding stations is less nerve-wracking but it involves a lot of walking, and an hour or so of preparation, as the food for each kakapo is weighed individually. "Each bird has different amounts depending on how much they eat and whether they forage for themselves [or] whether they are supporting chicks," Mr Machin said. "We put [the food] into little hoppers. We clean up the water. We check for any mould, and bring back any food that they have left so we can judge how much they have eaten." It takes the three volunteers who feed about an hour-and-half to organise the food. Then they each have to trek around the island to the feeding stations. "The walk, depending how fast you want to go, takes anywhere from three-and-half to six [hours]. Six is if you take it real slow taking in some scenery," said Mr Machin. For those not quite so keen on all the walking involved, the other volunteer role is that of cook. It's a role New Zealander Rennie Gould has taken on with aplomb. "I'm not terribly fit so I decided to be cook rather than nest-minder. I'm really glad I did; it's been great," she said. For her, coming to help with the kakapo gives her a break from the intensity of her work as a criminal defence lawyer. 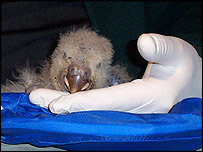 And the deaths last year of three young female kakapo hit home with Gould. "When they lost three, I just really wanted to do something." Nest-minding for the five kakapo chicks on the island has finished for this season, but volunteers will be continuing to feed the kakapo during the rest of the year. And in coming antipodean summers, nest-minders will again be needed, as the Department of Conservation aims to lift the female kakapo population from 38 to 55. 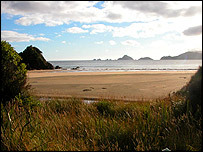 And while Codfish Island/Whenua Hou may not match up to the usual vision of an island holiday - accommodation is in bunkrooms, the toilet has been dug into the ground and cell phone reception can mean a hike up a hill - it is unique. Ben Machin said: "You're on an island where you can't come unless you are working for DOC. An absolutely unspoilt island."